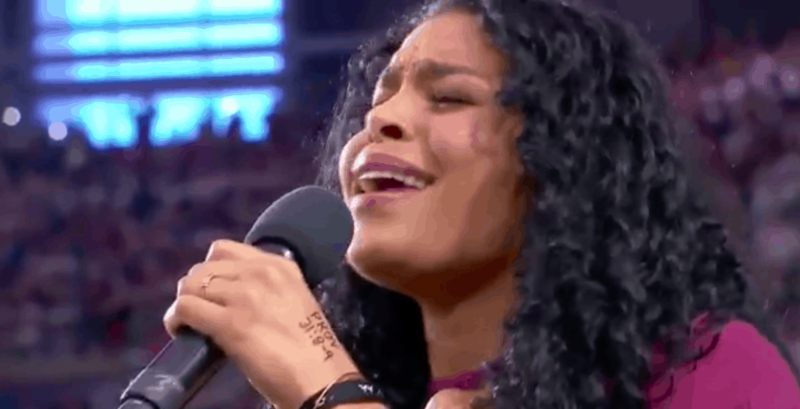 When Jordin Sparks took to the field to sing the National Anthem in Arizona ahead of the Cowboys vs. Cardinals NFL game on Monday night, she was walking into a cultural firestorm. The last 24 hours had seen football players, coaches and even team owners kneeling in solidarity during the national anthem in protest of police brutality against black people. President Donald Trump referred to anyone who does so as a “son of a b****” and said they should all be fired. So when Sparks sang the Star Spangled Banner, all eyes were on her, and she knew it. That’s why she scribbled a subtle, biblical message on her hand where the cameras would catch it: Proverbs 31:8-9. As she sang, the Dallas Cowboys, coach Jason Garrett and team owner Jerry Jones all knelt with linked arms, in silent protest. You can watch Sparks’ performance here.